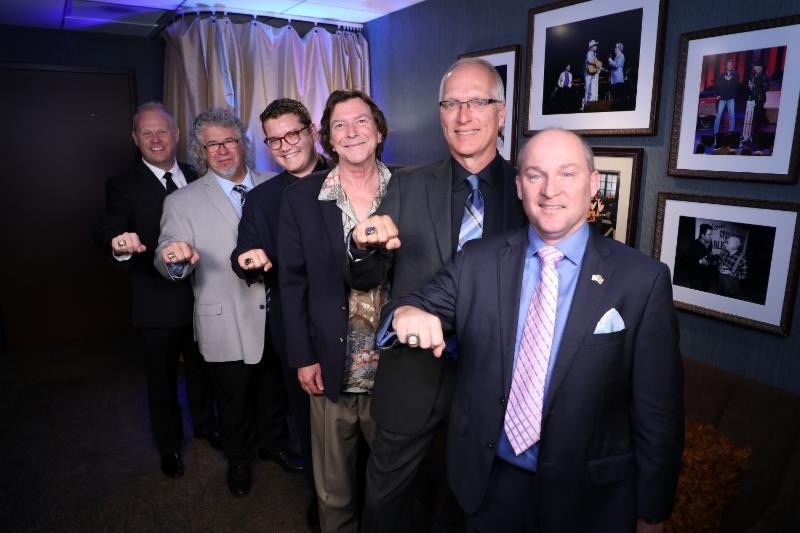 Multiple members of Dailey & Vincent’s world-class band were honoured recently at the legendary Grand Ole Opry, where they were awarded a golden ring commemorating more than 5 years touring with the Grammy-nominated duo. Springer Mountain Farms CEO Gus Arrendale was present to help present the commemorative rings. When you’re a band leader, or in our case band leaders, it’s most crucial to surround ourselves with the very best musicians and singers you can possibly find. Darrin Vincent and I have been so blessed with these fine gentlemen that perform with us. Not only are they great musicians, entertainers and singers, but they’re great people – Jamie Dailey. Being side men in the past, we understand the importance of being recognised and appreciated. Thanks to Gus Arrendale of Springer Mountain Farms for helping us show our gratitude for 5-plus years of loyalty and hard work. These rings are a small part of honouring and leaving behind their music legacy for them and their families to remember for years to come. Thank you and congratulations for a job well done, it’s much deserved – Darrin Vincent. Mile Twelve Release City on a Hill. Sam Bush Says Stop The Violence.